Turkey’s consumer price index fell 1.44 percent month-on-month in November, official data showed on Monday, bringing the annual inflation rate down from a 15-year high as a stronger lira, tax cuts, and discounted products helped to trim prices. A plunge in the lira’s value fueled the inflation surge this year, triggering a massive central bank rate hike, but one analyst said the sudden downturn in prices now brought with it the risk of an early loosening in monetary policy. As it grapples with high inflation, one of the main economic concerns for investors, the central bank has at the same time faced pressure from President Tayyip Erdogan, a self-described “enemy” of interest rates, to lower borrowing costs to spur growth. Year-on-year, consumer inflation stood at 21.62 percent in November, data from the Turkish Statistical Institute showed. A Reuters poll forecast a 0.75 percent monthly decrease in November and annual inflation of 22.6 percent. In its battle against inflation, Ankara has cut taxes on consumer products such as vehicles, furniture and white goods and encouraged shops to offer at least 10 percent discounts until the end of the year. Transportation prices slid 6.46 percent while food and non-alcoholic beverage prices fell 0.74 percent, the data showed. The producer price index fell 2.53 percent in November for an annual rise of 38.54 percent. Stoked by the weak lira TRYTOM=D3, whose decline against the dollar this year peaked at 47 percent in August, inflation surged to 25.24 percent in October. Finance Minister Berat Albayrak, Erdogan’s son-in-law, said the downward trend in inflation would continue. “We will continue to carry forward the structural steps that we have started in the fight against inflation with all our ministries,” Albayrak said on Twitter. The lira has recovered in recent months after a massive 6.25 percentage point rate hike in September and an improvement in relations with the United States. It was steady at 5.2 against the dollar on Monday, still down more than 26 percent this year. 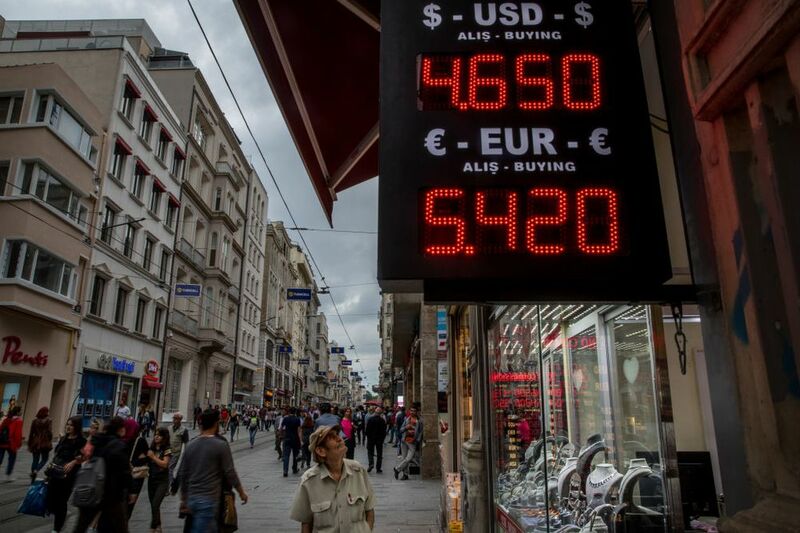 Turkey’s economy is seen shrinking 1.4 percent in the fourth quarter and officially entering a recession – defined as two consecutive quarters of negative growth – in the first three months of 2019, a Reuters poll showed in October. As the economy slows and inflation falls, prospects for further rate hikes are now off the table, said Jason Tuvey, senior emerging markets economist at Capital Economics. “With political pressure on the central bank to loosen policy likely to mount, there’s a growing risk that policymakers decide to loosen policy even earlier, and more aggressively, than we currently anticipate,” he said.